VAAS Academic Decathlon Team - Division III State Champions!!! 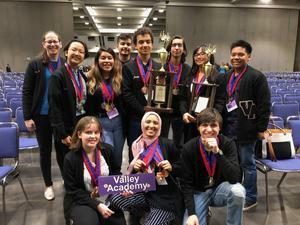 This weekend, our Academic Decathlon team competed in the State Championships in Sacramento. The team: Ameera Mulla, Monique McNulty, Brandon Colechio, Julia Gomez , Genesis Penaloza , Jorge Hernandez , Shaunt Issagholian , Jody Williams , Elijah Day and Kayla Duldulao. They brought home many individual medals for Science, Social Science, and Speech and they scored first place for Super Quiz. They worked hard all year. Congratulations Vipers!